Cast Iron Versus Nonstick Pans – Which Is Better? While it’s important to eat a healthy balanced diet, it’s important to focus on other aspects of your lifestyle as well. What you use when you cook your food actually matters too. 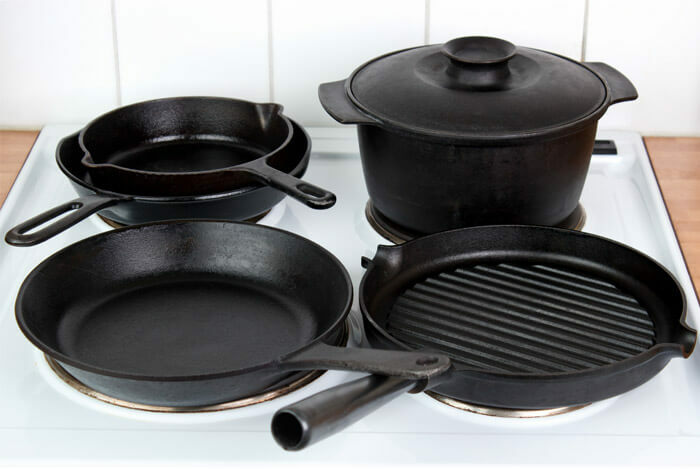 Today I’m going to share some information I’ve researched about cast iron and nonstick cookware to figure out which one of these kitchen staples is a safer bet. 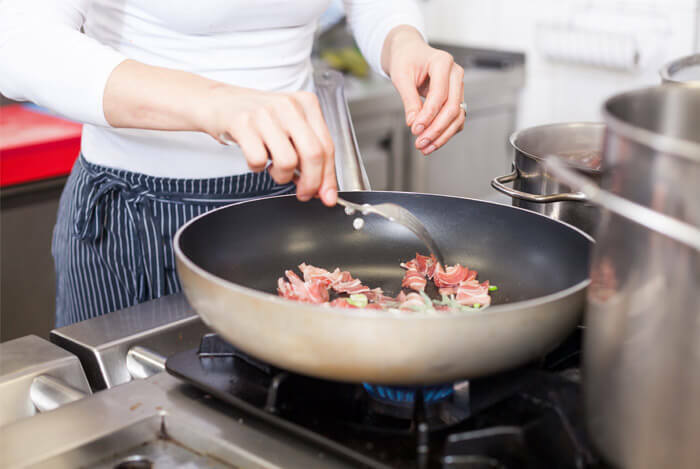 What Is Nonstick Cookware Made Of? Are Nonstick Pots and Pans Safe? In 1938, when Roy Plunkett was working for DuPont he invented polytetrafluoroethylene (PTFE), a substance that resists corrosion and provides a smooth, frictionless application. DuPont saw value in this substance and trademarked it as Teflon. While Teflon was used in the military, DuPont was hesitant about using Teflon in cookware. 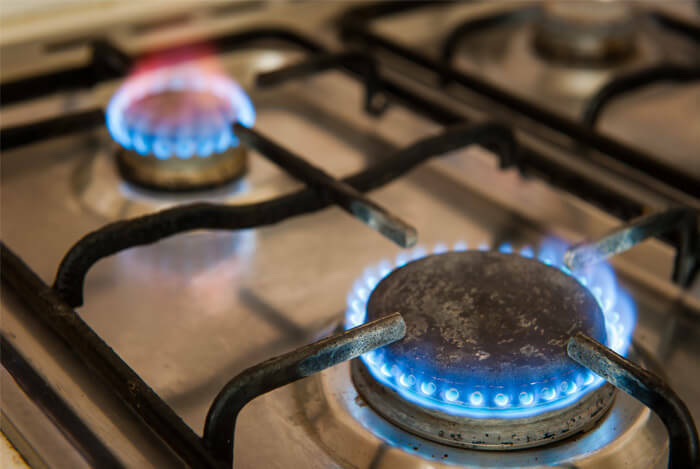 DuPont was worried about the potential issue of Teflon’s characteristic of releasing toxic gases at high heat levels. 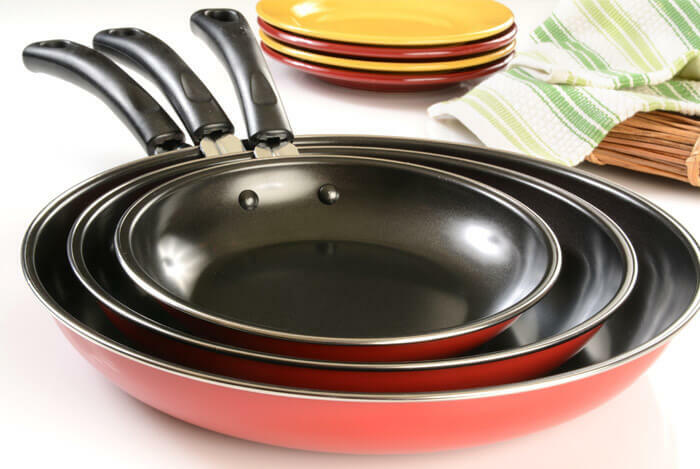 The appeal of easy cleanup and using less fat to cook, has made nonstick cookware a favorite among home cooks. In fact, pans with special coatings “constituted 90 percent of all aluminum cookware sold” in 2006. I’m sure that number’s even higher now. 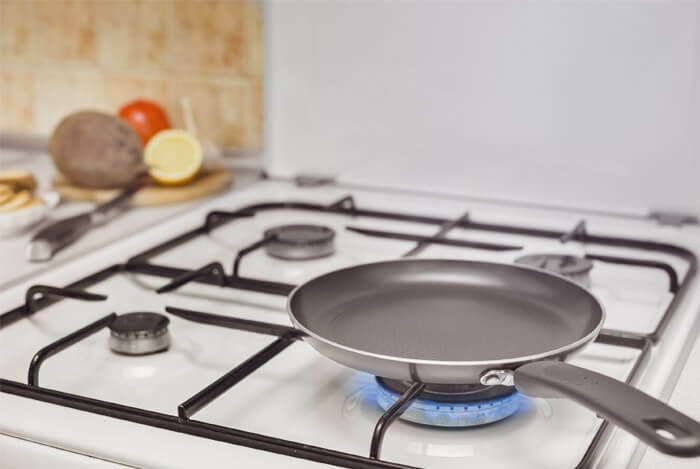 Robert L. Wolke, Ph.D., a professor emeritus of chemistry at the University of Pittsburgh, says that nonstick cookware is virtually safe except when heated to high levels. You see, when you overheat the nonstick coating, the molecules that make up the PTFE coating start to break down and release perfluorooctanoic acid (PFOA). During these breakdowns, “toxic particles and gases, some of them carcinogenic, can be released”. This happens if the pans are heated to about 500 degrees F.
This is like chemistry class all over again. 500 degrees, the highest temperature you can “safely” cook up to, is not that hard to reach. In fact, heating an empty, lightweight nonstick pan on high heat takes just under two minutes on high to reach 507 degrees. The very reason nonstick pans work so well is because they’re coated with compounds known as fluoropolymers. 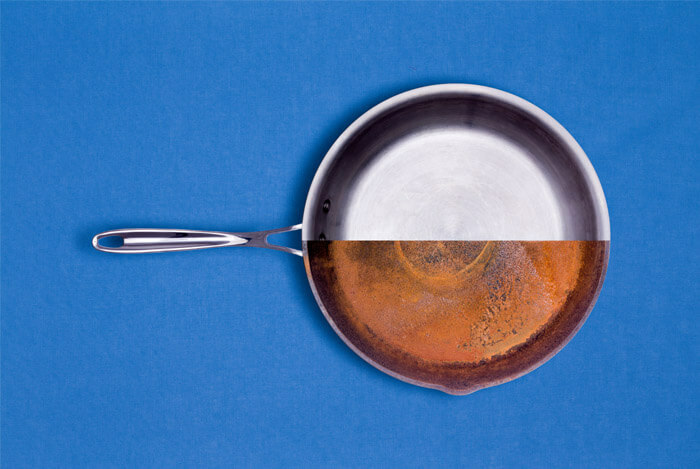 When the pans start to chemically decompose at high temperatures, they’re more likely to leach into your food and the air. Thankfully, Wolke says that the odds of inhaling enough of these gases to make us very sick are low. 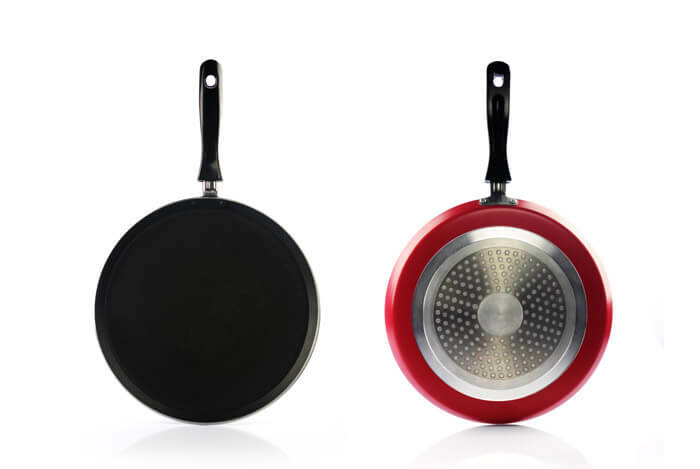 As long as you follow the manufacturer’s guidelines for your nonstick cookware, you shouldn’t have any adverse effects. Always heat the pan with food in it if possible, or only a few minutes without food. Like we saw above, preheating empty pans sends the heat sky high in a very short amount of time, releasing those chemicals. Only use your nonstick cookware on medium or low heat on the stove and under 500 degrees F in the oven. This means no broiling or high heat searing. 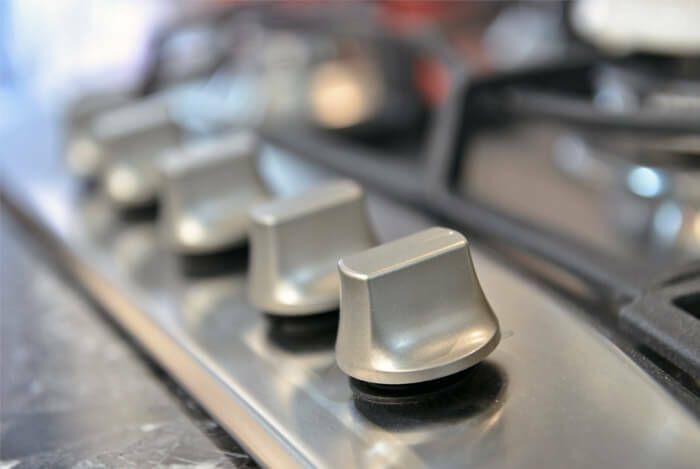 Don’t use the maximum heat setting for nonstick cookware on burners that put out above 12,000 BTUs (for a gas stove) or 2,400 watts (for an electric range). To further disperse any fumes, keep the exhaust fan on during cooking with your nonstick pans on medium heat. 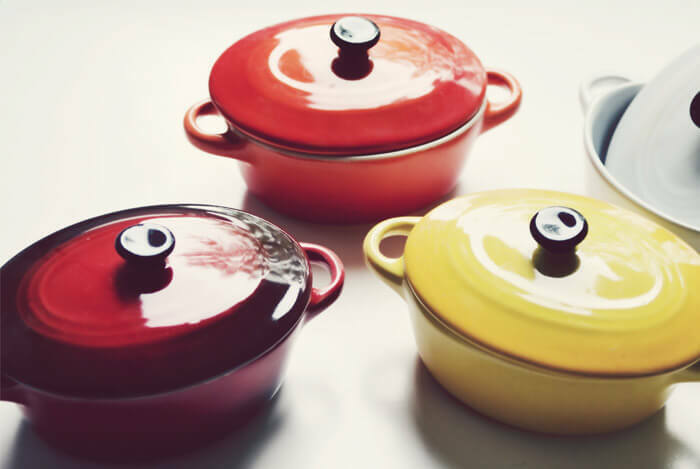 Choosing heavier nonstick cookware is a better option than purchasing some other lightweight counterparts. The heavier pans take longer to heat and do so slowly. 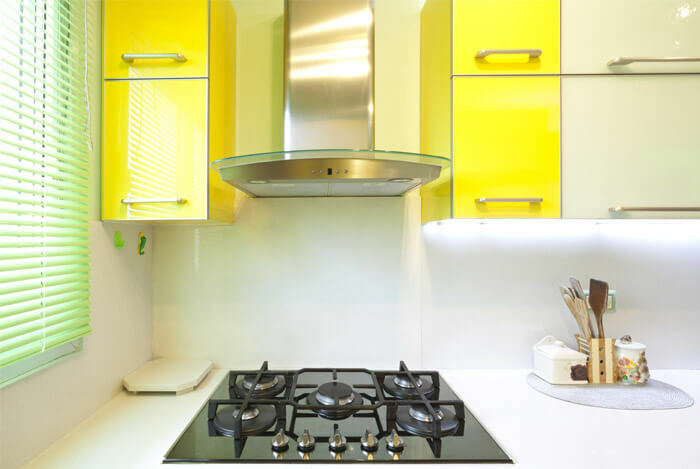 You’ll be able to cook most things quickly without having to reach high heat levels. 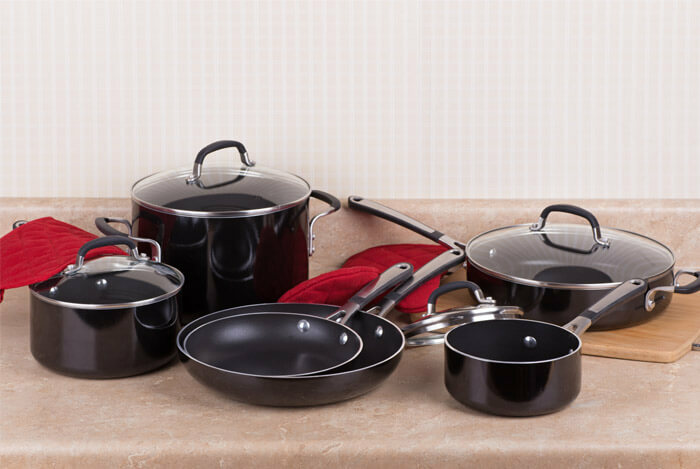 Don’t use anything abrasive that may scratch or chip the nonstick coating, such as metal utensils or steel wool. 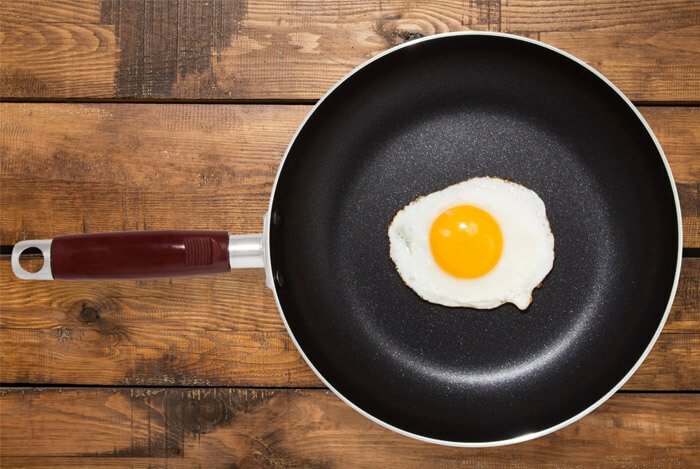 Paul Honigfort, Ph.D., a consumer safety officer with the Food and Drug Administration, says that flakes of nonstick coating wouldn’t actually get absorbed by the body, but it’s a good idea to play it safe. Personally, if you start to see signs of damage, I’d just get rid of it. I’m guilty of keeping things that still work, but should be replaced. But try to rotate your nonstick cookware to get longer lives out of different pots and pans instead of always using the same ones. Get new ones periodically to keep degradation levels low. Or, you could just use another option, like cast iron cookware. When most people see cast iron cookware, they probably imagine pioneers on the range cooking meat over a campfire, but cast iron cookware has been around since the Han Dynasty in China (206 BC – 220 AD). 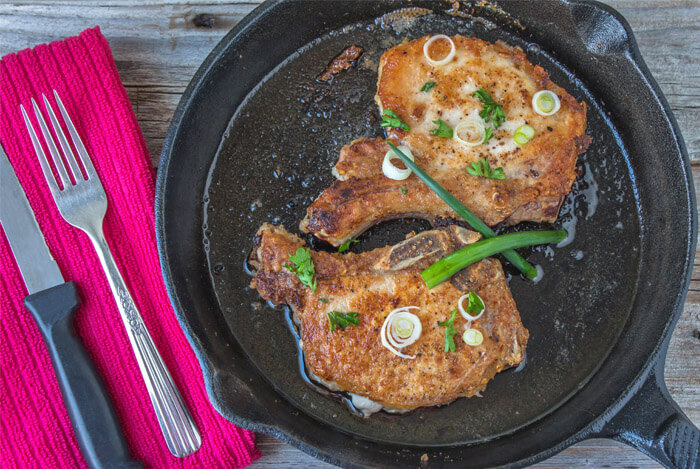 And there’s a reason cast iron has continued to be a popular choice among chefs and home cooks alike. Cast iron can be pre-heated to high temperatures without degrading, which makes it ideal for broiling and searing foods. 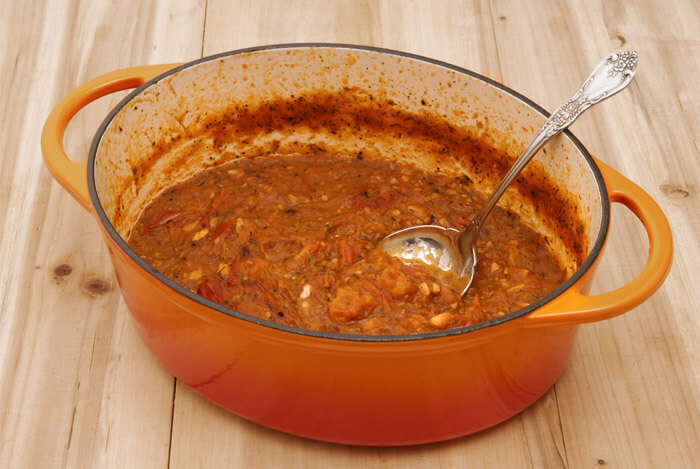 A big seller of nonstick cookware is not having to use a lot of fat to cook with. When you cook with something like stainless steel, your food sticks to the pans and burns without a protectant like butter or oil. You’ll have to ‘season’ your cast iron cookware to make it nonstick. This involves spreading a layer of oil in the pots and pans and heating it so it becomes polymerized oil. This “plastic-like substance that has bonded to the surface of the metal…gives well-seasoned cast iron its nonstick properties”. Since cast iron is made of, well you guessed it, iron, you may actually get a boost of iron just from cooking in it. As the food cooks, it picks up very small amounts of iron from the pan, giving you a little boost in iron levels. There’s a lot to think about when it comes to using nonstick cookware. But there’s also a lot of leeway to still use it safely. When you cook something like scrambled eggs, you make the food encompass the whole pan and decrease the heat of the pan overall. Cooking stuff like this at low temperatures is perfect for quick, nonstick cooking. But if you’re going to cook something longer than five minutes, you may want to choose cast iron cookware instead. You don’t have to worry about high heats or monitoring the time the pans have been hot. What’s your take on cast iron versus nonstick pans? Have anything else you’d like to share? Let me know in the comments below!